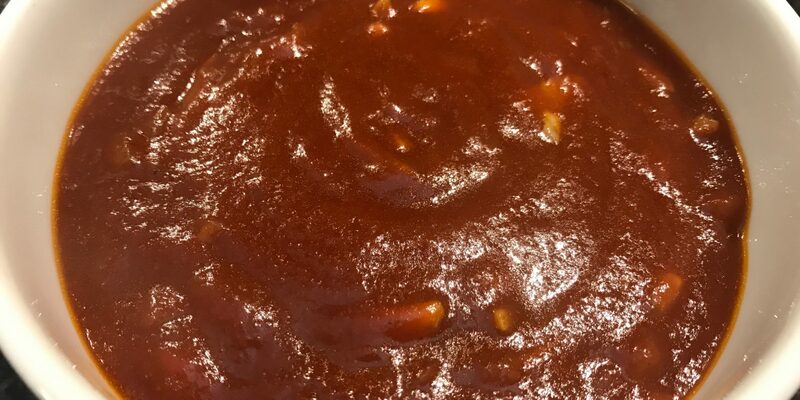 What makes a great barbecue sauce? People debate this across the country. A Carolina sauce differs from a Tennessee sauce, which differs from how Kansas City does it. And Texas has a style all its own. But I find hidden wheat, gluten, soy, sugar, even dairy in barbecue sauces, depending on the style. With great respect to all, I’ve created my own version, which blends a couple of styles, combined with a number of dietary parameters. 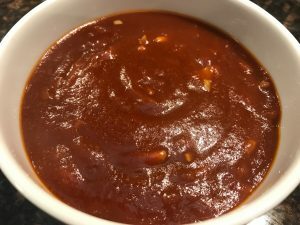 What I love about this sauce is that it is sweet, sour, and a little spicy all at once, and with the options I give, it should work for just about everyone. Most of all, I think it’s delicious, and it contains no gluten or refined sugar or dairy, unlike many sauces out there. A big win for me, and I hope for you, too! Let your sauce simmer for the recommended amount of time. As it simmers it reduces, meaning some of the liquid cooks off. As this happens, the flavors meld together, the excess liquid evaporates, and the flavors of your sauce come forward. It’s best to adjust your seasoning once your sauce has simmered because you will see how it truly tastes. Check expiration dates. Chuck the old stuff. Use fresh ingredients. It makes a difference in the flavor of your food. It might seem like the other half of that moldy onion is perfectly fine, but let it go! Best not to chance getting any of that stinky, and less than healthy mold in your yummy sauce. Using a little to a lot of spice in this recipe is your call. Even if you don’t like spicy food, I recommend using just a little spice to balance the sweetness and sourness of the sauce. It may not have a big kick, but the sauce will be more balanced. I start with less sweetener and add it if I need it. I use plus signs because some people prefer a sweeter sauce and some prefer a more sour sauce. I always recommend starting with less because you can always add as the sauce cooks. You can’t take it out! Too sweet? Add a little more vinegar and spice. Too spicy? Add a little more sweetener and vinegar. Too sour? Add a little more sweetener and spice. Not enough flavor? Start by adding a pinch more salt. If that doesn’t bring out the flavor then starting adding balanced amounts of sweetener, spice, and vinegar. Remember salt brings out flavors, so if your food tastes flat, always try a pinch of salt first to see if that brings the flavors out. Tamari is a gluten-free, wheat-free soy sauce. But it is made of soy. Soy sauce is made of wheat and tamari is made of soy. I know, food can be confusing! If you are gluten-free, tamari may be a good soy sauce swap for you. But, if you are soy-free as well, Coconut Aminos may be a better option. Coconut Aminos are a liquid made from the aged sap of coconut blossoms and salt. It is a low-glycemic, vegan, and gluten-free alternative to soy sauce, with 17 amino acids. Coconut aminos have about 65% less sodium than regular soy sauce. It’s considered paleo as well by most paleo diet followers. Note: the + sign means you may want to add a little more. Start with less and adjust to your taste as the sauce simmers. Over medium high in a saucepan heat your chosen fat and sweat onions. Cook for 3-4 minutes. Add sriracha, chipotle or chili flakes (if using). Cook for 3-4 more minutes, stirring every few minutes. Add garlic. Cook 2-3 more minutes, or until onions are translucent, and fat is absorbed. Add tamari, Worceshire (or coconut aminos), vinegar, maple syrup, coconut nectar, and tomato paste. Stir well and cook for 2-3 minutes. Slowly pour in water and stir until smooth. Add pinch of salt. Cover and Let reduce on low heat, simmering for 15 minutes. Store in an airtight container in fridge for 7-10 days or freeze for up to 3 months. Use it on your barbecue chicken, any pulled or smoked meat, or to top your favorite burger or meatloaf. You can’t go wrong!